The Hard Disk Crusher (patent pending) ensures that your confidential information remains confidential by destroying it permanently. After being crushed by the Hard Disk Crusher, the data can never be recovered again. It is much simpler and faster to use the Hard Disk Crusher than it is to reformat a disk or use a degausser. Furthermore, it has been proven that degaussers don't always work. New disks have such strong shielding that the magnetic oersteds (Oe) used to destroy the data can only achieve a high enough field intensity to destroy the read-write arm. Therefore, it's often possible to remove the platters, put them in new disk housing with a new read-write arm, and read the data that you thought you had destroyed. Unfortunately, due to new disk shielding technologies, degaussers have become unreliable. Though reformatting a disk can wipe out the data, reformatting a disk is very time consuming. It can take hours to reformat one disk. And the system reformatting the disk needs to be operational. The Hard Disk Crusher can destroy a disk and the data on it in just seconds without the need of a peripheral PC or workstation. With the Hard Disk Crusher you can crush over 60 disks an hour. It drills through the hard disk's spindles and physically creates ripples in the platters making it impossible to recover the data. One customer informs us that they destroyed over 9000 drives in a month, and another customer destroyed over 800 drives in day. The Hard Disk Crusher is durable and transportable. You can put it in your vehicle and take it from one location to another. It uses a standard 220 outlet and can crush a disk in 10 seconds. The destruction chamber is made of case hardened steel. 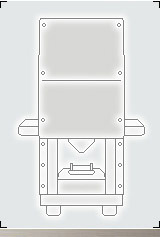 Its unique safety features ensures that the crushing device will not operate unless the safety door is shut. If someone opens the door while a disk is in the process of being crushed, the crusher will shut off. In the event that a military or intelligence agency needs to evacuate a facility in an emergency due to an impending hostile attack, the Hard Disk Crusher can be used to destroy sensitive information in record time. No embassy or defense installation that has the possibility of unfriendly take over should be without a Hard Disk Crusher. To find out more about the Hard Disk Crusher, inquire here. SEE THE HDC IN ACTION NOW!